Body aches are often an unfortunate but normal part of aging. But the widespread, chronic pain that comes with fibromyalgia can be debilitating, robbing our “golden years” of much of their luster. Late in her life, my maternal grandmother, who died in December 2000, often complained that her legs hurt. At that time, fibromyalgia wasn’t part of the discussion, so we dismissed her discomfort as a side effect of her Parkinson’s disease and/or an unfortunate consequence of living into her 90s. Today, as I struggle with fibromyalgia and watch my mother do the same, I’m left to wonder if my grandmother suffered with the disorder as well, and perhaps her own mother before her. 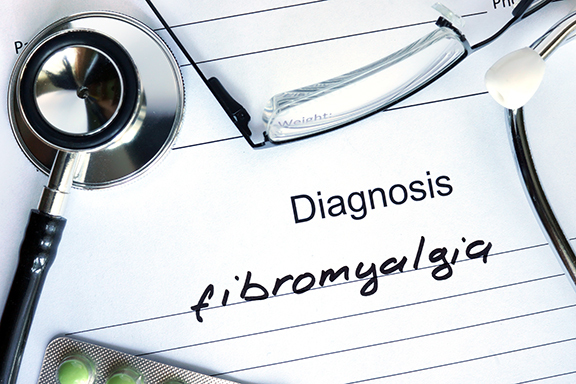 Fibromyalgia once was little more than a catch-all diagnosis when doctors couldn’t find an obvious physical cause for tenderness and stiffness of muscles and associated connective tissue. What’s more, many in the medical community, and in society at large, didn’t accept fibromyalgia as a legitimate ailment. Imagine suffering with near-constant pain, along with other equally troubling symptoms, and being told by doctors, family and friends that it was all in your head. Now, thanks to television commercials and other advertising touting medications commonly prescribed for fibromyalgia, the word has become part of our national vocabulary, and most people have at least heard of it. In addition to the pain, which frequently worsens at night, robbing the patient of much-needed rest, those with fibromyalgia typically become fatigued quickly and endure headaches, restless leg syndrome, brain “fog,” depression, sensitivity to touch, muscle spasms, digestive issues and other symptoms. It can be like having a flu that won’t go away. My muscles get so knotted that I can feel the bulges beneath my skin. I become quite stiff and can’t sit for long periods. Just getting out of bed can be agony on the worst days. After I was diagnosed with fibromyalgia sometime before 2008, I fell into a funk, I’m not proud to say, and let my malady rule my life. My work performance surely suffered, as did my personal relationships. When I was downsized out of my journalism job, I focused for much too long on being sick instead of on what direction to take my professional life next. I became a classic couch potato. Then I landed a part-time position as a recess supervisor at an elementary school, which forced me to get out of my recliner and start moving – and living – again. Today, I’m an active volunteer at Clearwater Marine Aquarium, where I give presentations and tours, do community outreach, and help rescue marine animals in distress. While my body often balks at being so physical – walking too many steps to count, standing for hours and occasionally helping capture manatees weighing hundreds of pounds – I’m convinced that being sedentary is worse for my health and well-being. My eating habits aren’t as healthful as they ought to be, and there are periods during which I don’t exercise as regularly as I should. But I’d like to share a few of my tried-and-true strategies for coping with fibromyalgia. Attitude is key. If you think you’re sick and useless, you will be. Hot water helps. If you don’t have a spa with massage jets, a long soak in the bathtub or a hot shower can do wonders for knotted muscles and creaky joints. Hand-held massage devices are OK. But getting a massage by hand is better because you can relax and enjoy it. And buying a massage chair that does more than just vibrate – one that kneads and rolls along your body – is a good investment. Take medication when needed, but don’t pop pills if you can tough it out. And don’t exceed recommended dosages. I’ve found best results from naproxen, an over-the-counter pain reliever. I tried two medications commonly prescribed for fibromyalgia, but neither was very effective, at least for me, and one left my brain so foggy I had memory difficulties. Make time for hobbies and time spent with people whose company you enjoy. Laughter is great medicine, and it’s free and unlimited. Give yourself a break. But don’t fall back on your pain as an all-purpose excuse for frequent inaction. Use your time and talents to help others. Volunteering is one of the best things I’ve ever done. It’s given me a renewed sense of purpose, improved my social life, helped me feel better about myself and, most importantly, filled a need in my community. Figure out what you love and get involved.